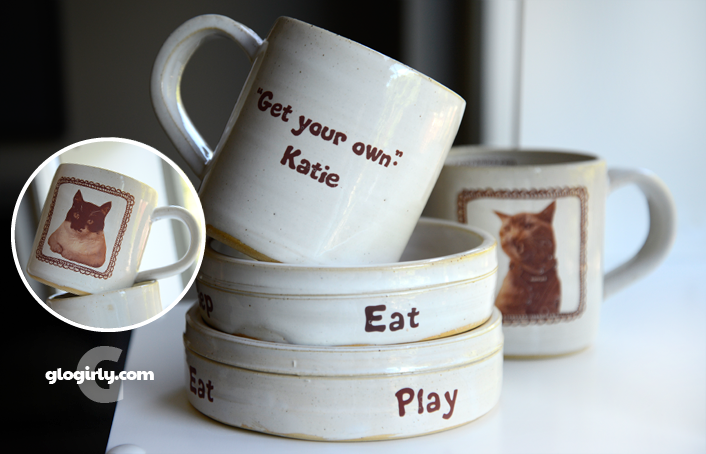 GLOGIRLY: A Crazy for Cat Lady Ceramics GIVEAWAY! I'm surprised Waffles' mug didn't have a chicken leg for a handle! I absolutely love how unique these creations are! Our Mommy was actually familiar with these and is in love with them! The photo mugs are awesome and unique. They are so sassy & stylish!! I love stuff that really lets you be a part of the process by offering customization!! 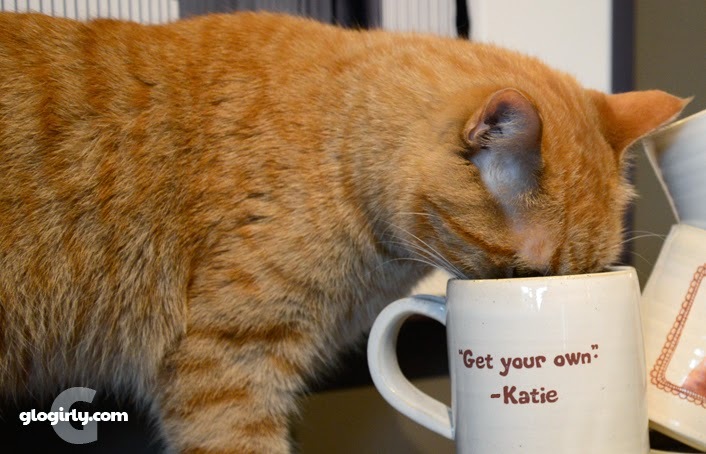 I love that they can be personalized with your cat's picture! They are lovely, good luck to everyone taking part!! Those are tooooooo cool!!! 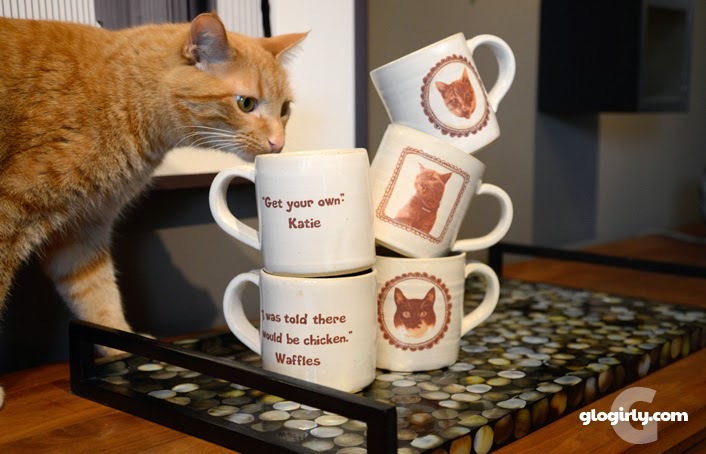 Waffles says "what's yours is mine..."
OMC - those dishes are awesome. M said I could enter and I will. Thanks Waffles and Katie for telling us about this. My favorite part is the pictures. What a fun giveaway! We especially love that they support shelter pets, too. That's a win for everyone! I love how they can be personalized. They are so nice & we can customize!! 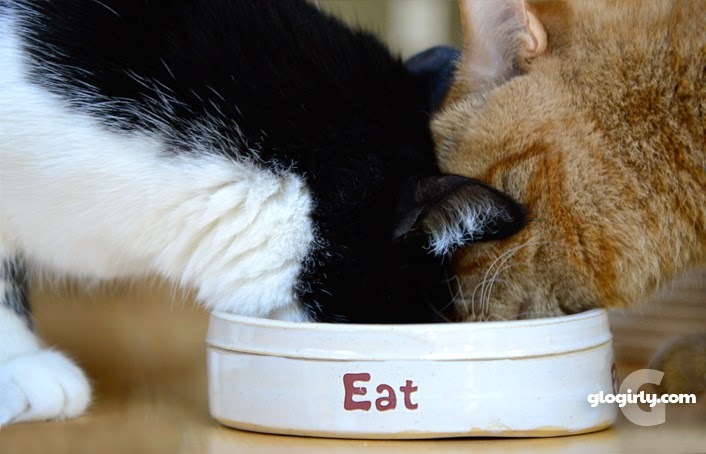 We have a pair of kitties that would just love to have one of those bowls. Just so they would have a bowl just for them. I first learned about these on another blog (can't remember who) and I adore her work. Love how unique they are and how they can be personalized. Thanks for the chance to win. I love these! They're gorgeous and hilarious. 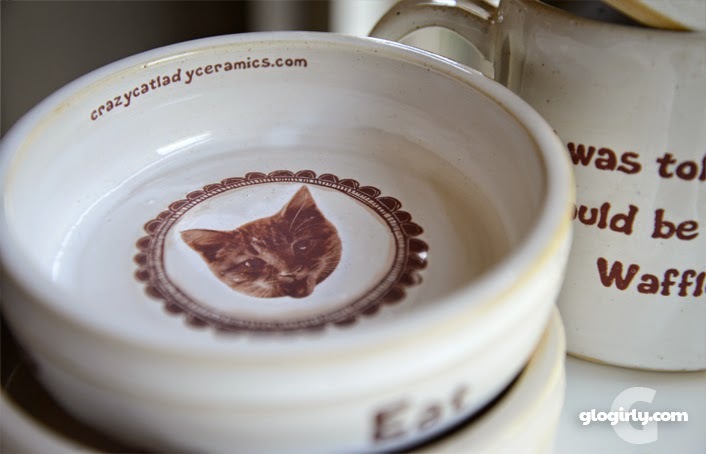 These ceramic dishes are pawsome! We like how they can be purrsonalized. Just what every cat lover needs! But can I really put a picture of my cat through the dishwasher? Love the pictures so each cat knows which dish is theirs..lol! Awesome that they are personalized! What Rumbles said! Pop would love another mug with my stunning mug on it. We thinks they always use Waffles' name cause they are hungry. 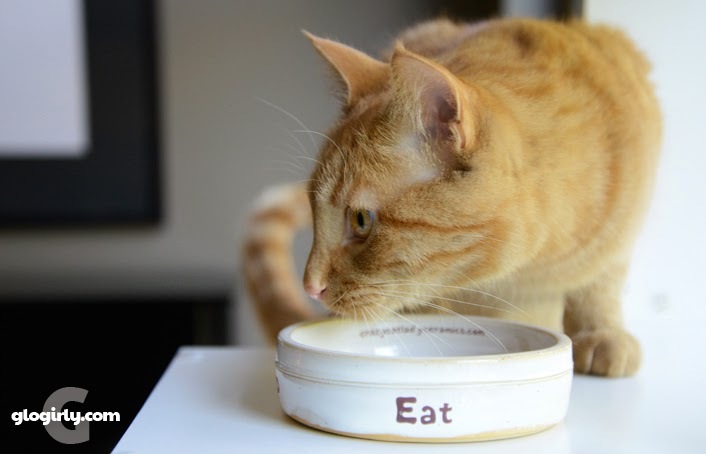 We loves the fact you can personalize them we wants one that says FEED THE CAT FIRST. We've had custom bowls made but having a custom image is bonus. Very clever idea. I love that CK can put her mug on another mug! They're so creative and cute and retro looking! those are just about as cool as it gets!! those are great! I need to have Mom get me my own dishes! These are very nice. 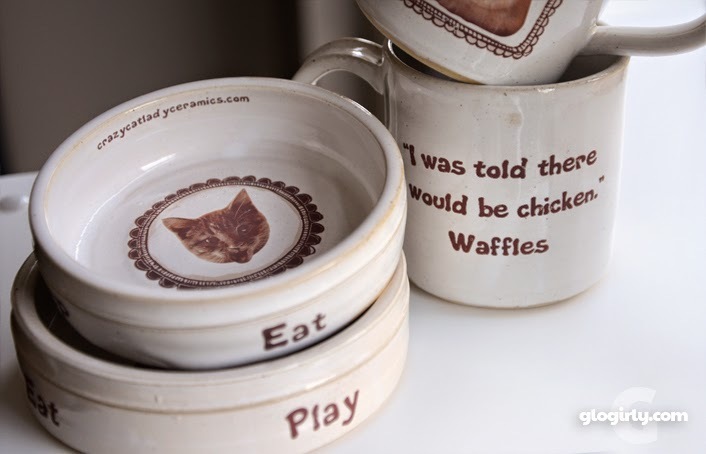 My kittehs would love to have these dishes. What a great giveaway. Angel would love these bowling. You have a great blog and great giveaway but not sure where you upload your photos for the giveaway. You don't need to upload any photos to be entered in the giveaway. Should you be drawn as one of the winners or if you were to order something from Crazy Cat Lacy Ceramics, you'd upload the photo(s) for your ceramic pieces through their website. We like the shape of the bowls. We don't like to touch the sides with our whiskers. What a cute idea with the photo personalization. I love the little frames around the photos! I like the option to personalize too. Maybe a picture of a chicken at the bottom? Oh Meow dat's weally cool. Hope weez win. This is lovely stuff, and I know we have some deserving pals in the USA we will gladly gift these too! I love that they are handmade! I did wheel throwing in HS and college and miss it terribly. I would love to have one of these! Those are pawesome! Thanks for the giveaway! I love that you can personalize them to reflect your own furbabies personalities! So very cute & I love that you can customize them. I'm already thinking about the pictures & phrases I'd pick. I love that there is a wonderful cause behind a cleverly designed product!